Photo: © John Pannell and used under license A cathedral dedicated to St Paul has stood at the highest point in the City of London for more than 1400 years. The present building is at least the fourth on the site and is the masterpiece of Sir Christopher Wren. It is a magnificent Baroque cathedral, crowned by a dome based on St Peter's Basilica in Rome. Its length, breadth and height are collectively awe-inspiring, inside and out. Immediately in front of the cathedral's main doors is a large public piazza from which rise the main stairs to the portico, which frames the west doors. The interior is floored with intricate marble patterns. Many of its pillars and carvings are gilded. St Paul's is London's Anglican cathedral, and as such it is an appropriate setting for great occasions. For the service described here it was also the obvious choice because it can accommodate such a large number of people. Previous funerals in St Paul's for important individuals in British history have included those for Horatio, Lord Nelson, in 1806, and Sir Winston Churchill, in 1965. But St Paul's is also a place of daily worship and Christian outreach. St Paul's Forum runs a programme of events, including public debates exploring Christian life and spirituality, whilst the St Paul's Institute seeks to bring Christian ethics to bear on public understanding of finance and economics. St Paul's also attracts a large number of tourists. The last time I worshipped there I was the guest of London's US community for its annual Thanksgiving Service. St Paul's cathedral is in the heart of the Square Mile, London's financial district, and is the most iconic of a collection of striking ancient and modern works of architecture, including the Guildhall and Mansion House, the Monument (to the Great Fire of London in 1666), and fabulous skyscrapers such as the Lloyds Building (called the Inside-Out Building), and 30 St Mary Axe, better known locally as the Gherkin. And so the local business community comprise St Paul's congregation. The Very Revd David Ison, Dean of St Paul's, opened the service. The first lesson was read by Amanda Thatcher, granddaughter of the deceased, and the second lesson by the Rt Hon. David Cameron, Prime Minister. Prayers were led by the Revd Prebendary Rose Hudson-Wilkin, Chaplain to the Speaker to the House of Commons; the Most Revd Patrick Kelly; the Revd William Hall; the Revd Ruth Gee; and the Revd Sarah Eynstone. The funeral address and final commendation were delivered by the Rt Revd Richard Chartres, Bishop of London, and the blessing at the end was given by the Most Revd Justin Welby, Archbishop of Canterbury, who was accompanied by his chaplain, the Revd Jo Wells. Music was provided by the choir of St Paul's, directed by Andrew Carwood, assisted by organists Simon Johnson, Timothy Wakerell and Richard Moore. Funeral of Margaret, Baroness Thatcher of Kesteven. It was a ceremonial funeral with military honours, but not a state funeral. Only for state funerals are international heads of state formally invited; for a ceremonial funeral all countries with a diplomatic presence in the United Kingdom are invited to send a representative. The cathedral can hold 2300 and it was full. I did not attend the funeral personally, but watched it on television (along with 4.4 million others). The congregation were greeted at the doors by a clergyman wearing an impressive black and silver cope. Attendants handed out copies of the service as people moved forward into the main part of the church. Her Majesty Queen Elizabeth II and the Duke of Edinburgh were met by the Lord Mayor of London carrying a mourning sword, and by a large number of clergy, who all escorted the Queen and the Duke of Edinburgh to their seats. Last time I visited St Paul's I found the wooden chairs rather uncomfortable. I was very comfortable in an armchair in my living room. Engaging. The congregation appeared to be chatting amiably before the service. Reunions were evidently being celebrated as people spotted old friends and former colleagues. It is not often that one can see so many eminent people all in one place. In the UK it is not difficult to catch sight of the Queen, as she puts herself about a great deal to meet her people, but an international guest list like this is a rare sight. It included two heads of state, eleven serving prime ministers, past and present politicians and diplomatic persons from 170 countries, senior representatives of world faiths, the Lord Mayor and Sheriffs of London, a raft of very senior clergy, and a motley collection of celebrities. 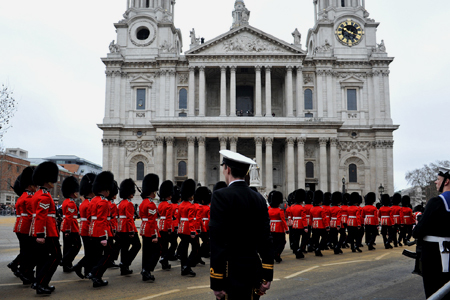 Outside, the route to the cathedral was lined by military personnel, including a scarlet splash of Chelsea Pensioners up the steps to the main door. Many present wore official uniforms; some were in traditional dress, clerical or ethnic. The coffin arrived on a gun carriage, drawn by six black horses led by a military band. There was a lot to watch. "I am the resurrection and the life, saith the Lord: he that believeth in me, though he were dead, yet shall he live: and whosoever liveth and believeth in me shall never die," sung by the choir as the coffin was carried into the cathedral. The first spoken words were: "We come to this cathedral today to remember before God Margaret Hilda Thatcher, to give thanks for her life and work, and to commend her into God's hands." A special booklet was printed for the service. The magnificent 1872 Henry Willis organ, rebuilt in 1977 by Mander Organs Ltd and further improved in 2008 by the same company. It is said in jest that when the organ's long trumpet stops on the west wall are played, the candles flicker on the high altar at the far end of the nave! I was diverted by the hats, particularly some ladies be-feathered fascinators apparently defying gravity, and the enormous feather-trimmed tricorne worn by the Lord Mayor. I was also distracted trying to remember names of people who used to be in public life; the combination of my poor memory, and their looking much older than they did last time I saw them, made it hard to recall names quickly. And, since I was watching via television, the announcer speaking over the beginning of anthems was very irritating. Solemn and dignified. The order of service included hymns, Bible readings, anthems from the choir and a funeral address. Most of the congregation were maintaining stiff upper lips but there were, as one might expect, some moments of emotion and surreptitious wiping away of tears. 8 – The Bishop of London is no stranger to preaching on big occasions and he had done his homework. He drew together a picture of the personal and political life of Baroness Thatcher through reference to his own knowledge of her and various speeches she had made to faith communities during her lifetime. The linking threads were obvious though not always tautly drawn together. The bishop supplied some amusing vignettes, such as a letter to a nine-year-old boy, Mrs Thatcher's contribution as a research chemist to the development of a new ice-cream, and her personal recommendation to the bishop to abstain from duck paté ("It's fattening! "), which drew a hearty laugh from the whole congregation. After the storm of a political life comes the calm. A funeral service is not the place to discuss an individual's legacy; memorial services do that. Funerals are for families, for remembering, and are places for hope. However, for the Thatcher family it may be hard to separate memories of a wife, mother and grandmother from the political memories. Lady Thatcher always showed courtesy and personal kindness to those who worked for her, and her capacity to connect with young people was admirable. Her upbringing in Methodism taught her to challenge what she considered to be wrong. She chose a life path taken by few women, and she often encountered prejudice against women, particularly those with children. Lady Thatcher believed that personal relationships and family ties are the foundation of civic life. The natural cycle of life leads inevitably to decay, but at a funeral, after the memories and the sadness, there is hope. The aspirations and memories of a lifetime are stored up in the cloud of God's being. Jesus says: "I am the way, the truth and the life." Lady Thatcher hoped that we may all come nearer to "that other country whose ways are gentleness and whose paths are peace." Death is not a full stop, but rather a way into another dimension of life. The singing. The choir were magnificent, and the congregation of more than 2000 people giving full voice to well-known hymns like "Love Divine" was spine-tingling. I was also impressed by the dignified bearer party, selected from the armed forces, and by the confident reading of the first lesson by Amanda Thatcher. These young people must have known the eyes of the world were on them, but they maintained superb concentration. Well, it was a funeral. They are not the most cheerful of events. Also, I was saddened that a few people outside the cathedral thought it appropriate to boo as the coffin passed. I may be old-fashioned, but if one attends a funeral surely one should at least be courteous; why upset genuine mourners by being rude? I was not physically present, but the end of the service seemed to have been organised carefully. After the coffin had been carried out of the building, followed by Her Majesty The Queen, the congregation remained in place until invited to leave. The St Paul's Cathedral Guild of Ringers rang Stedman Cinques on the cathedral's half-muffled bells. I don't think any was on offer. However, according to the BBC, the City of London Corporation invited some of the guests to a reception at London's Guildhall after the service. 9 – Good planning meant worship proceeded smoothly and the music was of a very high standard. Yes. Lady Thatcher was a strongly committed Christian. In the last ten years of her life she worshipped regularly at the chapel of the Chelsea Hospital, and would have been known to some of the Chelsea Pensioners who lined the steps of the cathedral for this service. She had chosen the hymns for her own funeral as well as the poetry printed in the service booklet. It was good to see her wishes respected and the chance for so many people who sincerely mourned her to have the chance to do so through such a thoughtfully-planned Christian event. The beautiful music, the overall dignity of the event, and the bells ringing half-muffled.